Alberto Gancedo didn’t choose TU Delft so much as he was doing his internship at TU Delft start-up Healthtech. But the university did choose to support him, to allow him to execute his plan, studying microelectronics at Delft University of Technology and working on a super-interesting project at the same time. Gancedo, originally from Spain, was searching for an internship outside of his home country to complete his bachelor’s degree. 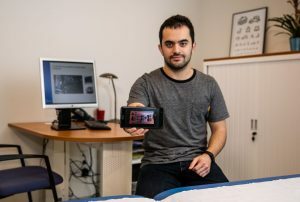 Someone he knew from the University of Cantabria, where he was attending, had contact with a start-up company in Delft, called Healthtech B.V. They were looking for an intern to help with the development of an aEEG measurement system. The position fit Gancedo’s skillset and he arrived in Delft in September 2016. After the completion of his six month internship, he returned to Spain to defend his bachelor’s thesis. Healthtech, however, was interested in having him return to complete the project’s development. As with many start-ups, however, the company was unable to offer Gancedo a paid position. Instead, they said he could return as an intern, provided he was accepted into a master’s programme at TU Delft. Fortunately, with Gancedo’s academic background, he was accepted into the electrical engineering master’s programme, in the microelectronics track. While this left him with a place to study and a place to work on his research, it didn’t leave him with enough funds to support himself financially. That was where the University Fund Foundation stepped in. The University Fund Foundation was established in 1925 to promote the interests of the university. Among other projects, they provide students with grants to conduct research at TU Delft. In particular, they search for projects which are exceptional and to support students who are conducting unique research at the university. The Fund had sent out an email to all of the faculties regarding their grant program, which found its way to Gancedo’s section head (Wouter A. Serdijn). He thought Gancedo’s project fit the bill. After completing an application as well as a series of interviews, Gancedo was informed he’d won the support which made studying at TU Delft possible for him. The money goes to support his research on an aEEG measuring system. This product aims to allow doctors to test the electrical signals in the brains of newborns. Currently, only babies who have obvious symptoms of brain damage are monitored. The equipment used for these tests is unwieldy and expensive, which makes it unavailable in the hospitals of many developing countries. Gancedo’s device, if it works, would be portable and significantly less expensive which would allow for wider testing and earlier interventions. Gancedo recognises that his device would mean a lot to doctors and hospitals with insufficient resources. “The funding has been a great opportunity,” he says. This entry was posted in education, electronics, general, neonatology, understanding the brain. Bookmark the permalink.